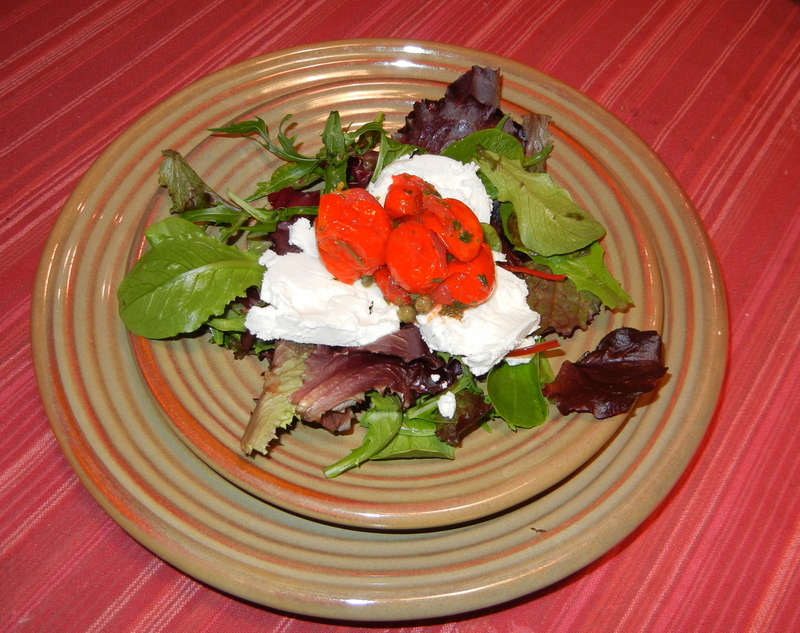 I started the meal with roasted cherry tomatoes over goat cheese and baby greens. I am really enamored of these roasted cherry tomatoes. I make them every couple of weeks and spoon them hot over chicken or fish, or most frequently cold on good bread or crackers spread with a Laughing Cow cheese wedge and topped with the tomatoes. I really felt like making something Moroccan, but had to find a recipe that wasn’t heavy on fruit and honey, which are so typical of this North African cuisine. 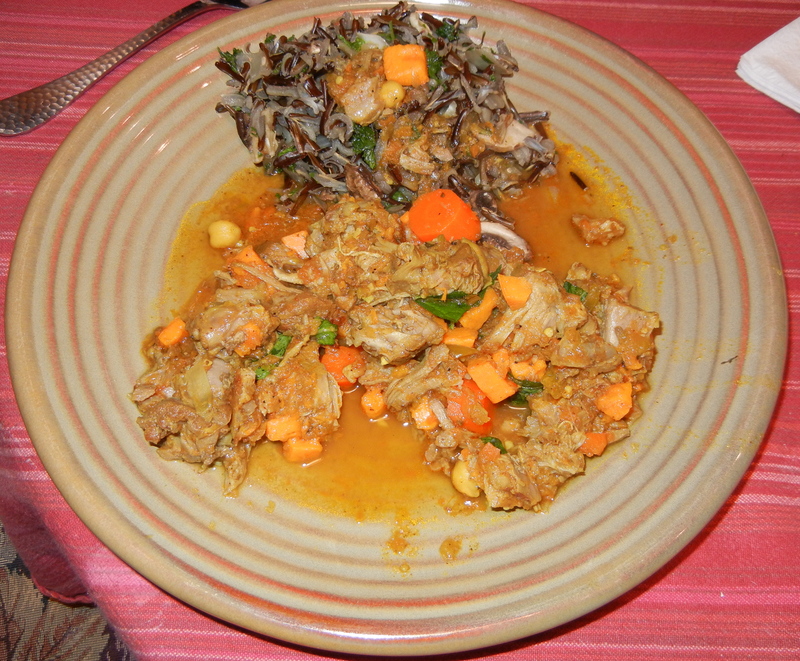 These braised veal shanks were perfect, and they even contain sweet potato, which is one of my friend’s favorite dishes (and one of the few starches she still eats.) Instead of serving it over couscous, which would be its more usual presentation, I made a wild rice pilaf, which I will post later. Wild rice is actually a grass, and not in the same category as wheat and other grains. This recipe, originally from Cooking Light, kind of puzzled me, because the serving size math seemed to be wrong. It called for 4 pounds of veal shanks. 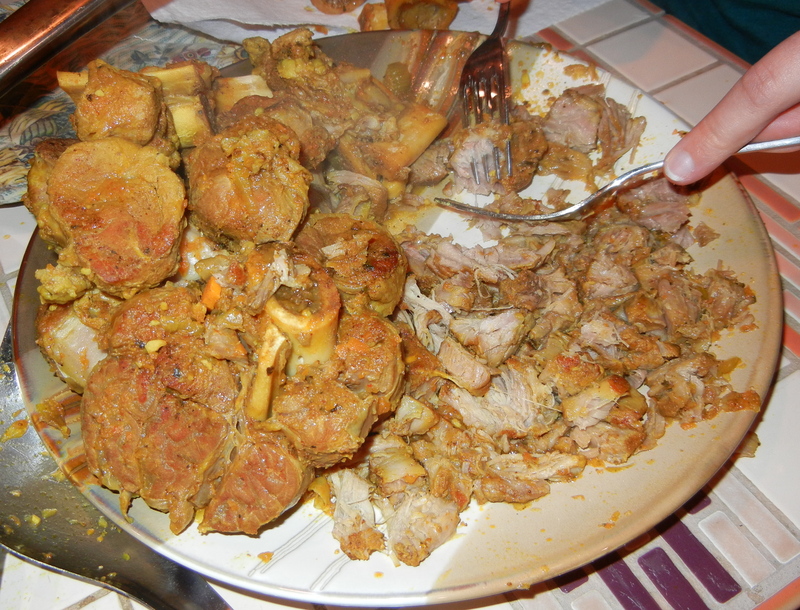 Even if there were a pound of bone in the veal shanks, that still leaves about 48 ounces of meat. But the recipe said it made six 3 ounce servings, which is mathematically impossible. That would only be 18 ounces of meat, total, and this made much more. I used cross-cut veal shanks, which may have been a bit meatier, even after the fat was trimmed away, although many pieces had only a little meat. The finished braised veal filled one of my largest pans. I estimate that there were easily 12 servings – I’m going to be eating the leftovers forever – yum. 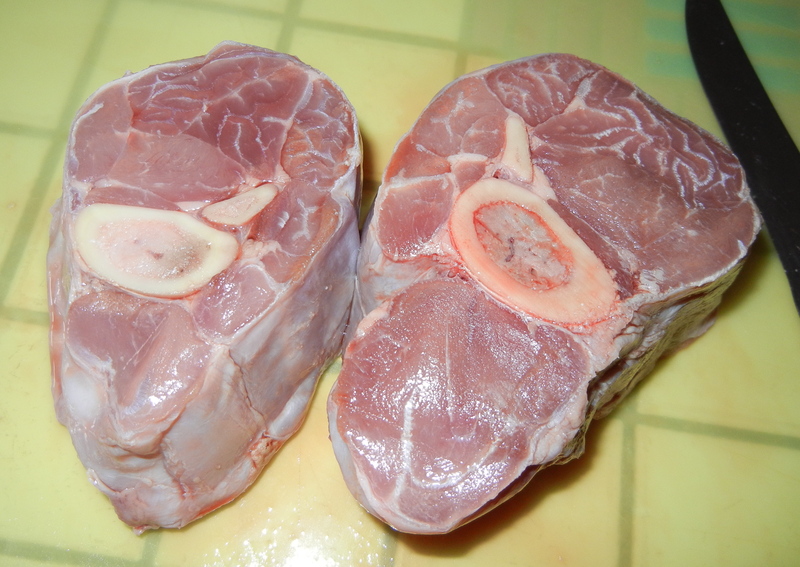 4 (16-ounce) veal shanks (because I used cross-cut shanks, I just purchased 4 lbs., rather than 4 shanks. To prepare spice rub, combine first 6 ingredients in a small bowl. Trim fat from veal; rub surface of veal with spice rub. Set aside. Heat oil in a (very) large Dutch oven or large heavy stockpot over medium-high heat. Add veal; cook 3 minutes on each side. Remove from pan. Add onion, celery, diced carrot, garlic, and ginger; cover, reduce heat, and cook 10 minutes, stirring frequently. Stir in 1 teaspoon turmeric, paprika, and coriander. Add broth, wine, juice, and tomato paste, scraping pan to loosen browned bits. Return veal to pan; bring to a boil. Cover and bake at 350° for 45 minutes. Turn shanks; add squash, carrot pieces, and chick peas. Cover and bake an additional 45 minutes or until veal shreds easily with a fork. Remove veal from pan, and remove meat from bones. Return veal to pan and stir into other ingredients. 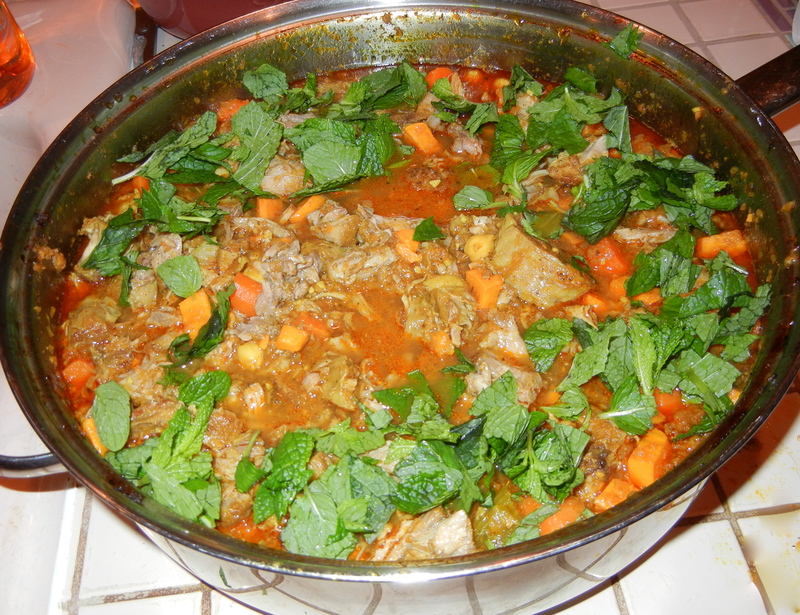 Serve veal and vegetable mixture over couscous or other pilaf. Garnish with mint, if desired. Makes 12 servings at about 6 grams of fat/serving.